Two years ago, after AMD promised to deliver the best performing CPU to data centers, its Barcelona architecture found the company trying to explain to customers why they shouldn't want performance, in an explanation that looked just as embarrassing as it sounded. 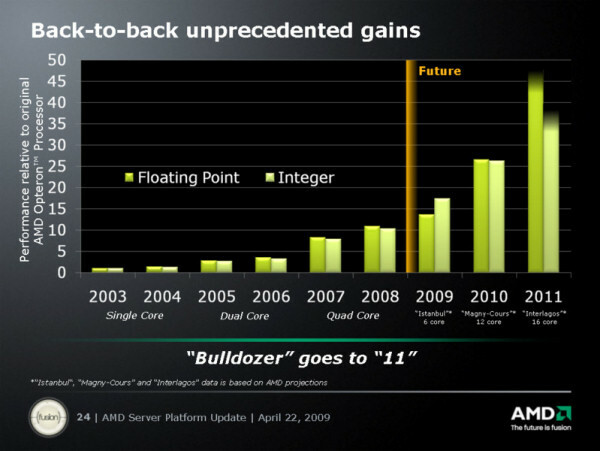 For AMD's last quarter, it actually managed to heal some of the ill effects of the negative economy on its desktop and mobile CPU segments, but not yet in the data center. Server CPU revenue is still hurting, though the company now declines to provide a specific breakdown. The way back for the company, it believes, is to create a marketing position that's similar to where it was in 2006, where system builders and partners started perceiving AMD as "one-upping" Intel. For that reason yesterday, the company unveiled something it's calling Direct Connect Architecture 2.0, an upgrade to the way its processor cores are directly linked to memory by means of the HyperTransport bus. It's this architecture which will enable a 12-core processor to enter production as soon as next year. But to make sure next year happens on time, the company is moving up the availability date for its "Istanbul" architecture -- hopefully a much happier place for AMD -- from what some had feared to be this fall, to next month. "This Istanbul native six-core product is once again going to be the world's first native Direct Connect Architecture-based product," said AMD server business unit VP Pat Patla yesterday, at times fumbling for the right superlatives. "And just like we've done with all of our past introductions, this is a six-core product that's going to be available for the two-socketed systems, four-socketed systems, and eight-socketed systems that are available and in market today." A tactic we've seen before with AMD, and which we're seeing again to no one's surprise, is to create one generation of processors which slips into the motherboards of its forebear with no problem. The next generation, then, will require a platform shift. In this case, Istanbul will slip into systems with Barcelona-era CPUs, and AMD can't be too eager for customers to do just that. "With Istanbul, we'll be bringing out 30% more performance into that same [Barcelona] thermal range, as we launch this product in June," said Patla. From there, the company can resume its focus on kicking out the current generation, and moving toward the next one. Currently, Opteron processors have two clustering categories as designated by their numbers: the 2300 series for two-way systems (two processors, for eight cores) and the 8300 series for four- and eight-way systems (4P and 8P). 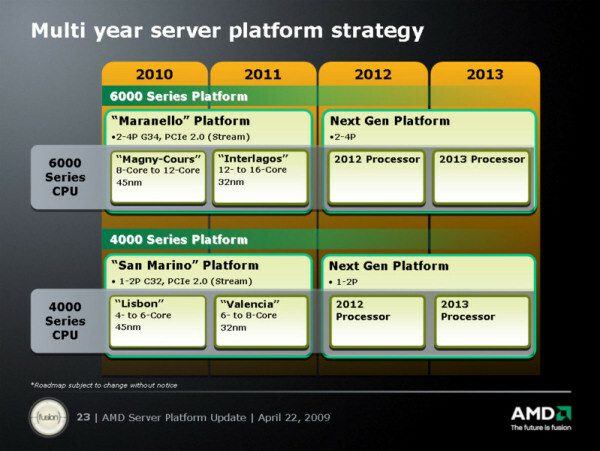 Beginning next year, AMD will unveil two new architecture series with different numbering: The 4000 series ("San Marino") will play to 2P servers, and the 6000 ("Maranello") to 4Ps, including its first eight-core line, called "Magny-Cours" but pronounced "many-core." Uh, gentlemen...did you forget something? Having been burned once before by the lack of a Barcelona part that could sustain 3.0 GHz, you can't help but be too careful about what AMD omits these days. "The four-way market's been compressing for years because of the multi-core capabilities, because of the throughput we're bringing into that space. There's been a little compression of the high-end two-way market and the four-way market, starting to converge a little bit, for the areas of server consolidation, for the areas of virtualization," reported Patla yesterday. Though he might have benefitted from a trimming of verbiage, his point was that virtualization has been driving up utilization rates for CPU cores, to the extent where it's becoming more practical to run four-way quad-cores than not only eight-way dual-cores but even eight-way quad-cores. When asked directly yesterday why 8Ps weren't mentioned on the Magny-Cours roadmap, Patla responded, "At this time, we think [because of] the thread count and the server density, the Magny-Cours product in the 6000 series will be aimed at the four-socket and the two-socket space moving forward." The first 45 nm Magny-Cours products are being sampled now, AMD executives said yesterday. The 32 nm drop-in replacements for Magny-Cours and "Lisbon" on the 4000-series side will come in 2011. But beyond that, AMD says it's planning what it describes as a completely new generation of x86 architecture; and 2012 would be just about the right timeframe for allies like IBM to unveil their master scheme: a 28 nm part made with simple fine-tuning to 32 nm processes. Up until that point, AMD is promising about 30% performance gains with each new generation, meaning 30% better performance for Istanbul over Barcelona, 30% more for Magny-Cours over Istanbul, and at least 30% more again, if not more, for the 16-core DCA 2.0 architecture it's calling "Interlagos" for 2011. Likewise, similar shifts will be seen in the 4000 series, with plans to implement its eight-core "Valencia" architecture in 2011. Nevertheless, AMD is omitting any hint of its frequency numbers for all its new parts, although this time it's prudently avoiding the step it took last time of claiming frequency was unimportant and attempting to explain why. This time, Patla advised reporters attending yesterday's announcement event to "pay more attention to the performance jumps." Indeed, those jumps will be noteworthy, but while AMD talks about 30% per generation, Intel is in the midst of implementing another seismic shift with Core i7. Making this new game plan work means betting that Intel's shift in its timing reflects the stumbling of the giant. If Xeon continues its gains in the server market, neither Istanbul or Valencia or anyplace else on the map may end up any more gratifying than Barcelona.